FOOD AT WHAREPUKE. Our Cafe & Restaurant is set amongst a lush subtropical garden and serves European and Thai inspired food. MARSDEN ESTATE, Kerikeri’s award winning winery.The estate is named after Samuel Marsden, who introduced the grapevine to New Zealand with 100 plantings at Kerikeri in 1819. AKE AKE RESTAURANT is set in an established Vineyard. John & Aynsley offer tastings of Ake Ake wines and also daily Vineyard Tours. Also suitable for weddings, private parties, corporate events. COTTLE HILL WINERY have a unique range of wines that suit most palates, from the novice wine drinker to the connoisseur. MAGNOLIA HOUSE is a five acre property, with an 80 year old villa which has been converted into a bistro for private dining, a venue for functions and workshops, and a catering kitchen for in and out-catering. 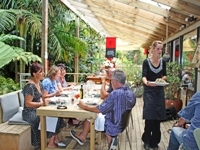 FAT PIG VINEYARD are a small hands-on vineyard in Kerikeri in the sunny Bay of Islands, open since 2003.